Gold Wing could be considered a brand unto itself, such is the recognition of what has been the gold-standard long-distance touring motorcycle for over 30 years. With each passing year, the venerable Honda Gold Wing has added more features and useful paraphernalia to the point where the machine is close to being the perfect long-distance two-wheeler. On the downside, the Honda Gold Wing is often referred to as a “couch-on-wheels.” Although that’s not necessarily a bad thing, it can be argued that a slimmed down, more agile Gold Wing would ride even better, especially at slow speed, as well as potentially attract a wider audience and maybe a younger demographic. For an overview, visit 2018 Honda Gold Wing First Look Fast Facts. For a quick ride review, visit 2018 Honda Wing First Ride Fast Facts. Also, even with all its incremental improvements over the last decade, the Gold Wing has missed out on a lot of the newer developments in motorcycling, especially in the realm of electronic rider aids—power modes and traction control, for example—as well as the new advances in Bluetooth and navigation. Even within the brand, the Gold Wing lacked Honda’s brilliant Dual Clutch Transmission (DCT), of which the Gold Wing was surely the perfect potential recipient. The main obstacle—a complete engine redesign was needed to accommodate the DCT. So, it was time for a complete reshaping. Ultimate Motorcycling was invited to Japan for a sneak preview and ride of the new Gold Wing, on the Twin Ring Motegi after the Japanese MotoGP round. Although a wide, smooth racetrack is probably not the ideal test arena for a luxury touring motorcycle, it was a good opportunity to at least sample the new machine. Needless to say, the new Gold Wing proved to be exceedingly impressive. Honda confidently brought along the old model as well, and riding the two back-to-back confirms the 2018’s differences on every level. The 2018 Honda Gold Wing comes in two versions—the standard Gold Wing, and the Gold Wing Tour. The former is an F6B-style bagger design with a shorter windshield and no rear trunk, while the Gold Wing Tour has the more conventional windshield, plus the rear trunk that includes the passenger backrest and armrests. 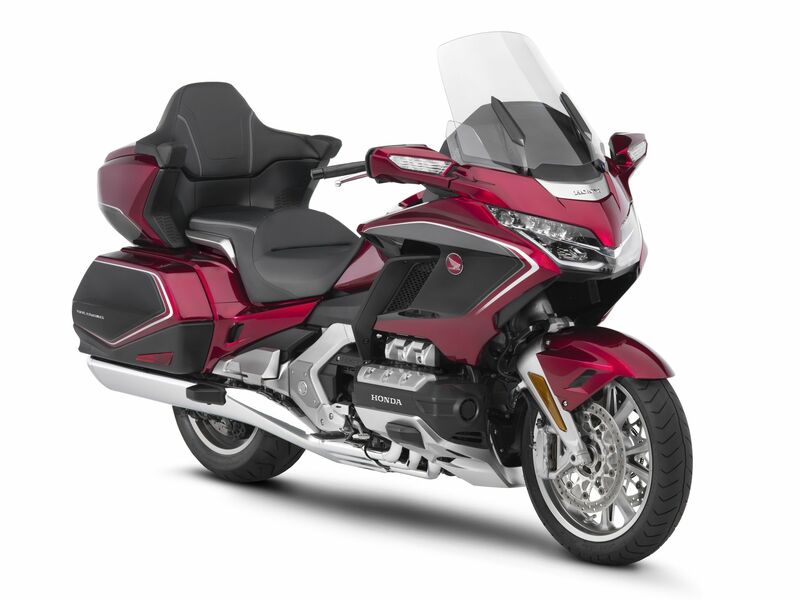 Ranging from a (claimed) curb weight of 787 pounds for the 2018 Honda Gold Wing (the bagger version with manual six-speed) up to 842 pounds for the Gold Wing Tour DCT with airbag, the new model has shed a whopping 90 pounds from last year. The overall difference in weight is immediately apparent when riding. NOT Honda’s latest paintjob! This ride was long before the official unveil and as Motegi is somewhat public, Honda opted to cover the Wing’s Candy Ardent Red paint in camo/stealth vinyl graphics. Weirdly, I didn’t hate it! It almost has that early Valentino Rossi design ethic he used to favor. Ok, I’m crazy, I know. The engine alone is over eight pounds lighter, and the mass has been brought much closer to the center of the machine. This makes the new Gold Wing noticeably more agile and easier to maneuver, especially at lower speed. The new motor is an 1833cc flat-six, however the similarities to previous Gold Wing powerplants end there. Honda uses its Unicam design for the new four-valve cylinder head. Those familiar with the CRF motocross bikes know how the Unicam system works—the cams actuate the intake valves directly, with roller rocker arms controlling the exhaust valves. This new design saves weight and has shortened the motor by over an inch. Honda did not seek more power for the flagship tourer as the Gold Wing already has a jet-turbine-like motor. However, the engineers were looking for more efficiency and less weight, and there is a mild power bump. The new motor has a one-millimeter reduced bore, and two-millimeter increased stroke, as well as changes to the intake and exhaust. This gives the Gold Wing more useful mid-range power, and that was noticeable when riding. Fuel consumption is improved by a whopping 20 percent according to Honda, and squeezing 42 miles out of a gallon of high test allowed a 1.1-gallon reduction in fuel tank capacity to 5.5 gallons, without sacrificing range per tankful. Other improvements to the engine include an IGS (Integrated Starter Generator) that combines the generator and starter-motor functions into one component. This allowed the removal of the starter motor and starter-system wiring—a weight savings of 5.3 pounds that also reduces noise during starting. The charging system output is increased to 1.56 kw/5000 rpm, up from a little over 1.00 kw/5000 rpm on the existing model, so extra lights and electrically heated gear will not be a problem. The front suspension is now a more-complex double-wishbone suspension setup that is more efficient at managing weight and absorbing bumps than a conventional fork. The wheel travel pivots upward rather than diagonally backwards, and that provided room for the now shorter motor to be moved forward in the chassis to improve mass centralization. This puts more weight on the front for much better front-end feel. Including the front suspension, the entire chassis is some 40 percent lighter than last year. The action feels much smoother and more controlled, with zero flex at the front, especially when braking hard. According to Honda, shock transmitted from the road to the rider is reduced by a mammoth 30 percent. The end result is a much more planted-feeling front end, and the Gold Wing is noticeably more stable when hard on the brakes; handling is greatly improved in general, and zero road vibration gets through to the rider. Bearings are used for the steering function, so it is extremely light yet positive, making the bike easier to steer at very slow speed without the machine being nervous or twitchy at high speed. The Gold Wing reacts positively to rider input and yet it is also as reactive as needed. Overall the suspension and handling, even in a straight line, is a significant and very noticeable upgrade, and that was on a smooth racetrack surface. I found the handling to be very precise and I could place the Gold Wing on the line I wanted through every corner. Even changing lines through a corner was zero problem, and cornering clearance is improved on the new model by a noticeable amount.